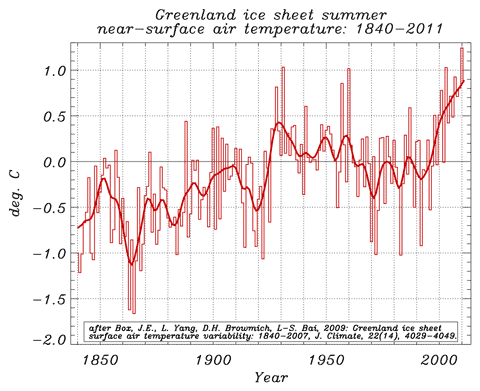 Current summer temperatures are well above previous levels, and are clearly contributing to both the reduction in albedo and the extreme ice mass losses reported in recent years. A strange definition of unusual, you might think. He goes on to put the event in its wider context. …this slight mid-summer melting is not because of anything we’ve done and there is no need for alarm. This “slight mid summer melting” was enough to wash out bridges and roads as rivers draining the ice sheet rose well above historic flood levels, but let’s set that to one side and look at the meat of his post. Treadgold visits Wikipedia to obtain a figure for the size of the Greenland ice sheet, then jumps on a number in the SA article and calculates how long it will take to melt the entire ice sheet. He arrives at a figure of 67,222 years and uses it pontificate about just how small a problem it really is. Sadly for Treadgold, his fact-checking is letting him down again. The Scientific American article Treadgold is so keen to denigrate includes a figure for annual ice sheet mass loss of 36 gigatonnes. I have been unable to trace where this comes from2, but it is way out of line with current estimates of ice sheet mass loss. Had Treadgold read down that Wikipedia page a little, he would have discovered that it reports annual volume losses of between 239 and 195 km3 from 2003-2008. 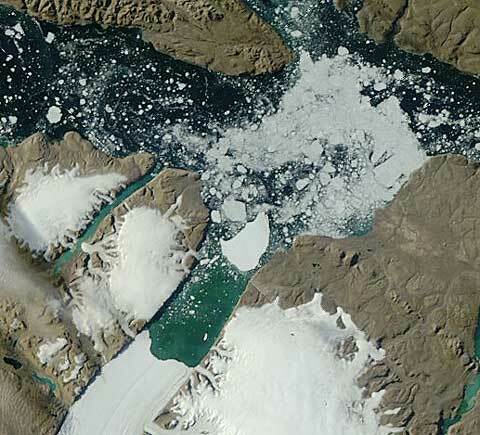 Project those numbers forward, and Greenland’s ice sheet has only got about 15,000 years to go — only 25% of Treadgold’s projection, but still quite a long time. Unfortunately, the current picture is worse than that. 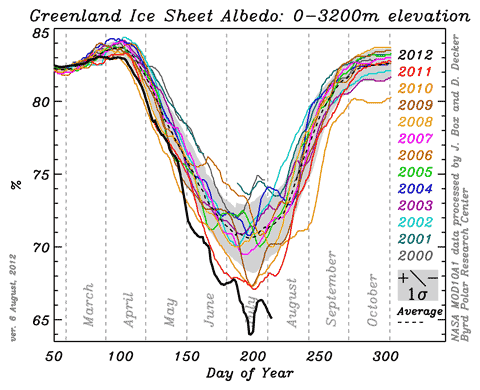 The 2011 Arctic Report card covers the 2010 melt season, and gives us two ways to look at Greenland’s mass balance — the surface mass balance, running at -344 Gt/year in 2010, and GRACE satellite measurement of total ice sheet mass, showing a loss of -430 Gt in the year. Plug those numbers into the total mass of the ice sheet3, and you get 7,000 and 5,600 years respectively. Now that’s what I’d call rapid melting. But even that’s likely to be unrealistically slow, because we know that mass loss from the Greenland ice sheet has been accelerating. 2011 was at least as bad as 2010, and 2012 is pretty much certain, given the evidence of this extraordinary summer, to have been even worse. This is not good news, not something that can be dismissed as “a hoax, a fraud, a betrayal, a cheat, a perfidy, a sham and a swindle”, as Treadgold’s thesaurus would have it. No, it’s a profound change to the surface of the planet, brought on by warming caused by human emissions, and unless we’re very lucky, the cascade of consequences are going to make life very difficult for our civilisation for the foreseeable future. Box has also published a “music video” of Greenland albedo over the last 12 years which demonstrates how the ice sheet has darkened as warming has progressed. It’s unreferenced in the article. All I can find is a news story referring to a study that finds that polar ice sheet mass loss is accelerating by 36 Gt per year. I’ll use Treadgold’s number: 2,420,000 Gt.